(Nanowerk News) Traditional genomic, proteomic and other screening methods currently used to characterize drug mechanisms are time-consuming and require special equipment, but now researchers led by chemist Vincent Rotello at the University of Massachusetts Amherst offer a multi-channel sensor method using gold nanoparticles that can accurately profile various anti-cancer drugs and their mechanisms in minutes. As Rotello and his doctoral graduate student Le Ngoc, one of the lead authors, explain, to discover a new drug for any disease, researchers must screen billions of compounds, which can take months. One of the added keys to bringing a new drug to market, they add, is to identify how it works, its chemical mechanism. "Rapid determination of drug mechanism would greatly streamline the drug discovery process, opening the pipeline of new therapeutics," Ngoc says. She adds, "Drugs with different mechanisms cause changes in the surface of cells that can be read out using the new sensor system. We found that each drug mechanism generated a unique pattern, and we used these cell surface differences to quickly profile different drug mechanisms." Details of this work appear in the current issue of Nature Nanotechnology ("A multichannel nanosensor for instantaneous readout of cancer drug mechanisms"). UMass Amherst chemists have devised a multi-channel signature-based approach to screening drugs using a gold nanoparticles with red, green and blue outputs provided by fluorescent proteins. 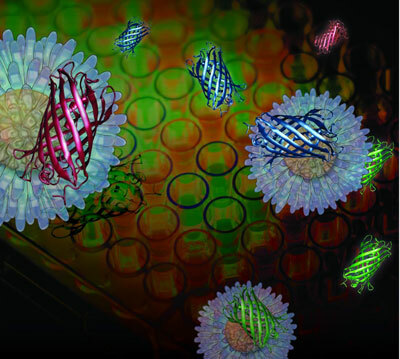 To expedite drug screening, the research team, which in addition to the chemists includes a UMass Amherst cognitive scientist and a materials scientist from Imperial College, London, developed a new, signature-based approach using a gold nanoparticle sensor system and three differently labeled proteins by color: blue, green and red. Using an engineered nanoparticle and three fluorescent proteins provides "a three-channel sensor that can be trained to detect subtle changes in cell surface properties," the authors note. Drug-induced cell surface changes trigger different sets of fluorescent proteins to turn on together, offering patterns that identify specific cell death mechanisms. The new nanosensor is generalizable to different cell types and does not require processing steps before analysis. So, it offers a simple, effective way to expedite research in drug discovery, toxicology and cell-based sensing, the researchers add. Some signature-based drug screening using traditional biomarkers exists today, but it requires multi-step cell processing and special equipment, limiting its usefulness the authors point out. With their three-channel, gold nanoparticle sensor platform, Rotello and colleagues solve those challenges and enhance accuracy. Further, they say, "the information-rich output allows the determination of a chemotherapeutic mechanism from a single measurement, providing answers far more quickly (in minutes) than current methods, using standard laboratory instrumentation." This invention could have a substantial potential impact on the drug discovery pipeline, says Ngoc. "The sensor is not only able to profile mechanisms for individual drugs but also determine the mechanisms of drug mixtures, that is, drug 'cocktails' that are an emerging tool with many therapies," she adds. Rotello emphasizes, "While we have decent knowledge of individual drugs, we still have a lot to learn about the mechanisms of combination therapies. In addition to drug screening, the simplicity and speed of this enabling technology holds the promise to greatly accelerate the search for effective cancer treatments, and provides a step forward in areas such as toxicology, where the safety of thousands of uncategorized chemicals needs to be assessed. The researchers point out that their new sensor system offers "a potential way forward for toxicology, providing a viable method to classify the tens of thousands of commercial chemicals for which no data are available."